As those of you who follow me on Instagram may know, just before Christmas I had my hair cut shorter - and whilst I love it, it is requiring a little more styling in the mornings, mainly because my hair has an irritating tendency to 'flickiness' at the ends. Whilst that would be fine if I wanted to do a 70s look on a daily basis, most days it just doesn't work for me. So that means it's time to get the GHDs out, and with that comes the need for heat protector spray. 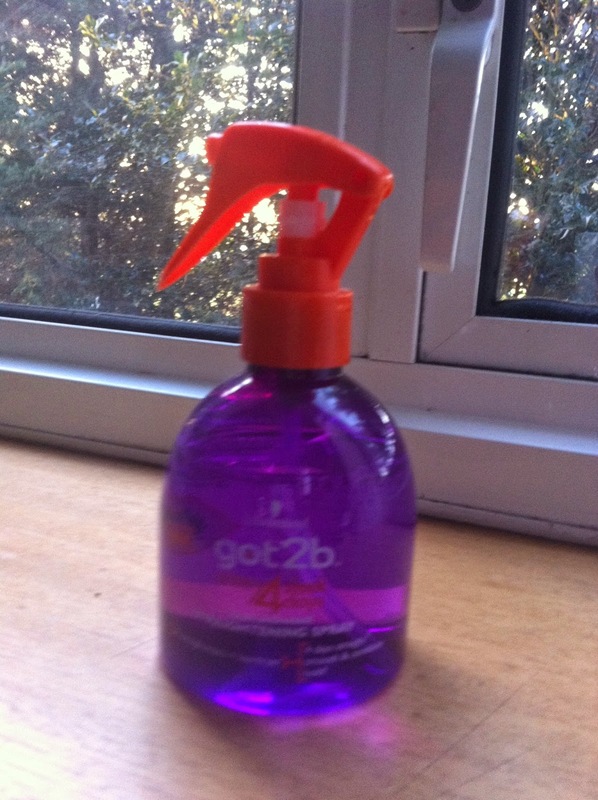 I picked up this Schwarzkopf Got2b spray after seeing it in a couple of magazines and also the fact it was on offer in Boots. Promising to hold your style for four days (or until you next wash your hair), this seemed like the perfect product; after all, anything that can save you time in the morning is good, right? As you can see from the photo below, it's very bright packaging - even when I'm trying to get ready in a darkened bedroom without waking Nick up or I'm rummaging around in the depths of a bag when travelling, I can always spot this fairly quickly. Its squat design means it's fairly compact so handy to fit into smaller spaces if you have limited storage. That said, the fact that the pump doesn't seem to lock is a bit of a worry when travelling, so if you're concerned about getting spray all over your stuff it might be best to keep this for at-home use. In the packaging, the product appears as a clear fluid, which is fairly standard for a heat protector spray. Smell-wise it isn't anything particularly special beyond that sort of 'hairdresser' smell, but to be honest I don't mind that; in fact I often dislike heavily scented hair products as sometimes they clash with perfume or other scented products I'm using that day. When sprayed on to the hair, the spray tends towards big squirts in patches rather than a fine mist - I suspect due to the pump action - so I would recommend combing it through before you start to straighten or focusing the spray on any particular hotspots (so for me this is the ends of my hair and also my fringe). I normally use this when blow-drying my hair and then another spray before running my straighteners over it, which is the advice the bottle gives for thick hair like mine, and whilst I definitely need that double dose, you might be able to get away with one round if your hair is fine. Overall, this is a bit of a middling product for me. It might just be that my naturally stubborn hair is just too much for the spray to cope with, but frankly the effort I'm putting in to get the results I want isn't worth it for me as a day-to-day thing - so I don't think I'll repurchase after this. But if you have fine hair then it might be worth giving this a go.